Myofascial Release is a technique applied to both the fascial connective tissue and muscles. Fascia is a web of connective tissue intertwined between all other parts of the body. It surrounds and supports all the organs, bones, joints, vasculature, nerves and muscles of the body. Fascia doesn't contract, like muscles do, but it can become adhered. Adhesions are areas where the fascia is "stuck" and restrict range of motion, cause postural dysfunctions and cause pain. To release these adhesions the therapist applies a stretch into the restriction and holds it while the tissue releases. The effects are cumulative and long lasting. Imagine slowly pulling a plastic bag in two directions so you are stretching it out without breaking it. Some specialized forms of MFR you may have heard of include Heller Work and Rolfing. 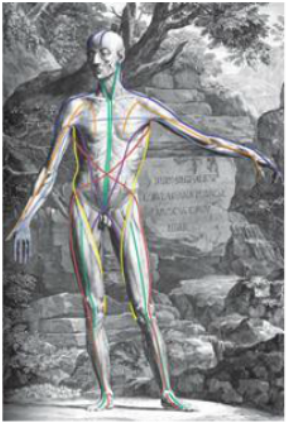 ​The image shown on the left is from one of the primary texts on the fascial system; Anatomy Trains by Thomas Myers. The coloured lines are lines of pull in the fascial system. If the fascia became adhered or restricted along the green line, for example, it would pull the head and neck closer to the pubic bone, causing a hunched forward posture. The person would be carrying their head too far forward and their shoulders would be rounded forward as well. This person would likely have pain between the shoulders and the back of the neck. Releasing this line can therefore correct a hunched posture, allowing the person to comfortably stand up straight.